Those beautiful vines are in full bloom right now and many of us love the sweet linger of the smell of honeysuckle. The vine has been used for years by herbalists as an anti-inflammatory for respiratory infections and even to treat bacterial infections internally as well as topically. Our family loves to simply sniff and suckle the nectar out, but decided we would distill some and use the hydrosol as a spray for cuts and burns. 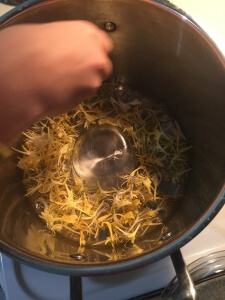 There are many ways to prepare the honeysuckle. It can be simmered and drank as a tea, but a hydrsosol takes advantage of rendering the essential oils and other water-soluble phytochemical properties the flower has to offer. Hydrosol is made by collecting the distilled water after the flower is gently simmered in the bottom of a stanless steel pot with distilled (haha) water that collects on the top of an inverted glass lid then drips down into a bowl that sits on top of a ramekin. 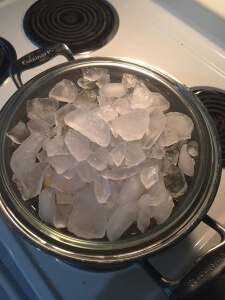 Ice cubes are added to the top of the lid and once the steamed essence from the flower hits the top of the cold lid, it drips back down into the bowl. This hydrosol lasts longer than a tea and again has more essential healing properties than can be rendered in a tea. After 30 minutes of distilling we had collected approximately six ounces of hydrosol which was left to cool to room temp, then poured into a sterilized amber spray bottle. Be sure if you plan to use your honeysuckle that it is wild-growing, not exposed to or treated with pesticides and is the correct cultivar- Lonicera Periclymenum. Happy honeysuckle hydrosoling everyone! Adding honeysuckle around ramekin to bottom of pot. Add enough water to submerge the flowers.